AICHI-KEN, Japan - June 21, 2018 - PRLog -- When two of the Philippines' most celebrated performers come together for one afternoon of music revelry, the audience can expect a collaboration nothing short of entertainment par excellence. 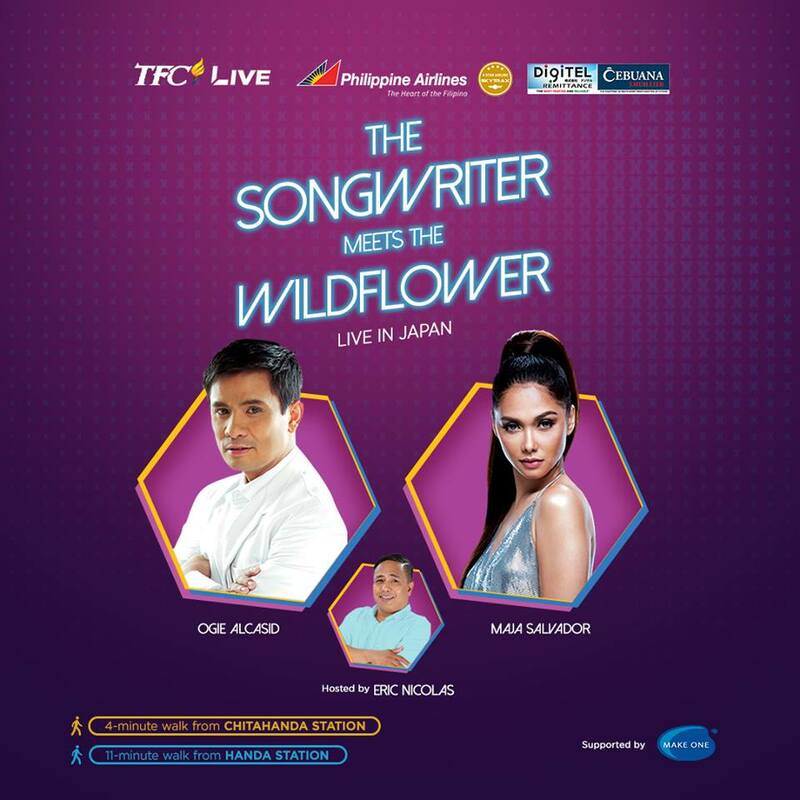 On July 15, the Philippines' award-winning singer-composer Ogie Alcasid joins forces with multi-faceted Dance Empress and concert performer Maja Salvador for TFC Live presents: "Songwriter meets the Wildflower" at Handashi Fukusi Bunka Kaikan, 1-22-1 Kariyado-cho, Handa-shi, Aichi-ken 475-0918. Alcasid, dubbed Hitmaker and a judge for the widely followed show "Your Face Sounds Familiar'seen on ABS-CBN The Filipino Channel (TFC), is set to perform for his first TFC show in Asia. former head of Philippine music organization Original Pilipino Music (OPM), and also a philanthropist. Meanwhile, Salvador, an actress who has created a name for herself for her widely followed characters Lily Cruz / Ivy Aguas, is also known for her dance moves that has earned her the tag Dance Empress. This Japan favorite who first performed for Filipinos in Japan in Kawasaki in 2008 and in Chiba in 2016, is expected to intensify the energy level of the much-awaited collaboration. Joining Alcasid and Salvador is host Eric Nicolas who will inject comic relief during the show. Also joining them is global representative and grand finalist of the Tawag ng Tanghalan sa It's Showtime Huling Tapatan Makoto Inoue. "The Songwriter Meets the Wildflower" happens on July 15 at Handashi Fukushi Bunka Kaikan, 1-22-1 Kariyado-cho, Handa-shi, Aichi-ken 475-0918. Gate opens at 12 n.n. Show starts at 4 p.m.